Pata, K; Santos, P.; Burchert, J. (2016). Social recognition provision patterns in professional Q&A forums in Healthcare and Construction. Computers in Human Behavior, 55, 571−583. Ley, Tobias; Seitlinger, Paul; Pata, Kai (2016). Patterns of Meaning in a Cognitive Ecosystem: Modeling Stabilization and Enculturation in Social Tagging Systems. In: U. Cress, H. Jeong, & J. Moskaliuk (Ed.). 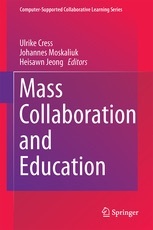 Mass Collaboration and Education (in press). Heidelberg: Springer [ilmumas]. Quaicoe, James Sunney; Pata, Kai (2015). Factors determining Digital Divide in Ghana’s basic schools. In: IST – Africa 2015 Conference Proceedings: IST-Africa 2015 Conference, Lilongwe, Malawi, 06 – 08 May 2015. Ed. Paul Cunningham and Miriam Cunningham . IEEE Xplore, 1−8. Eradze, Maka; Pata, Kai; Laanpere, Mart (2015). Analyzing Learning Flows in Digital Learning Ecosystems. In: Yueh-Min Huang, Frederick Li, Qun Jin (Ed.). Advances in Web-Based Learning – ICWL 2013 Workshops (63−72). Berlin-Heidelberg: Springer Heidelberg. (Lecture Notes in Computer Science; 8390). Ruiz-Calleja, Adolfo; Dennerlein, Sebastian; Tomberg, Vladimir; Pata, Kai; Ley, Tobias; Theiler, Dieter; Lex, Elisabeth (2015). Supporting learning analytics for informal workplace learning with a social semantic infrastructure. Proceedings of the tenth European conference on Technology enhanced learning. Ed. Klobucar, T; Conole, G. Switzerland: Springer, 634−637. (9307). Quaicoe, James Sunney; Pata, Kai (2015). The Teachers’ Digital Literacy Determining Digital Divide in Public Basic Schools in Ghana. In: Information Literacy: Moving Toward Sustainability, 552: European Conference on Information Literacy (ECIL), Tallinn, Estonia; (11th to 22nd October 2015). Ed. Serap Kurbanoğlu, Joumana Boustany, Sonja Špiranec, Esther Grassian, Diane Mizrachi, Loriene Roy. Springer, 154−162. (Communications in Computer and Information Science). Quaicoe, James Sunney; Pata, Kai (2015). Modelling Factors Influencing Digital Readiness: A Case of Teachers in Ghana’s Basic School System. In: Advanced Web-based Learning, ICWL 2015 , 9412: The 14th International Conference on Web-Based Learning (ICWL) 2015, Guangzhou, China (5th – 8th November 2015) . Ed. Frederick W. B. Li, Ralf Klamma, Mart Laanpere, Jun Zhang, Baltasar Fernández Manjón, Rynson W. H. Lau. Springer, 271−277. (Lecture Notes in Computer Science). Ley, Tobias; Cook, John; Dennerlein, Sebastian; Kravcik, Milos; Kunzmann, Christine; Pata, Kai; Purma, Jukka; Sandars, John; Santos, Patricia; Schmidt, Andreas; Al-Smadi, Mohammad; Trattner, Christoph (2014). Scaling informal learning at the workplace: a model and four designs from a large-scale design-based research effort. British Journal of Educational Technology, 45 (6), 1036−1048, bjet.12197. Laanpere, Mart; Pata, Kai; Normak, Peeter; Põldoja, Hans (2014). Pedagogy-driven Design of Digital Learning Ecosystems. Computer Science and Information Systems, 11 (1), 419−442. Tammets, K; Pata, K. (2014). The Model for Implementing Learning and Knowledge Building in the Extended Professional Community: A Case Study of Teachers’ Accreditation. Systems Research and Behavioral Sciences, 31 (1), 127−143, sres.2138. Pata, K.; Bardone, E. (2014). Promoting distributed cognition at MOOC ecosystems. In: Lecture Notes in Computer Science (LNCS). Learning and Collaboration Technologies. Technology-Rich Environments for Learning and Collaboration. Part I., 8523: HCII International, LCT 2014, Crete 22-27.06.2014. Ed. Panayiotis Zaphiris, Andri Ioannou. Springer, 204−215. Pata, K.; Eradze, M.; Laanpere, M. (2014). e-Textbooks: Towards the New Socio-Technical Regime. In: Cao, Y., Väljataga, T., Tang, J.K.T., Leung, H., Laanpere, M. (Ed.). New Horizons in Web Based Learning (226−235). Switzerland: Springer. (LNCS ; 8699). Elvira Popescu, Rynson W.H. Lau, Kai Pata, Howard Leung, Mart Laanpere (2014). Advances in Web-Based Learning – ICWL 2014. Cham Heidelberg NewYork Dordrecht London: Springer. Tammets, K; Pata, K; Laanpere, M. (2013). Promoting Teachers’ Learning and Knowledge-building in the Socio-technical System. The International Review of Research in Open and Distance Learning, 14 (3), 251−272. Tammets, K; Pata, K. (2013). The trends and problems of planning outcome-based courses in elearning. In: Saar, E; Mõttus, R; Bern, E. (Ed.). Higher Education at a Crossroad: the Case of Estonia (281−301). Peter Lang Publishers House. Ley, Tobias; Cook, J.; Dennerlein, S.; Kravcik, M.; Kunzmann, C.; Laanpere, Mart; Pata, Kai; Purma, Jukka; Sandars, John; Santos, Patricia; Schmidt, A. (2013). Scaling Informal Learning: An Integrative Systems View on Scaffolding at the Workplace. In: Hernández-Leo, D.; Ley, T.; Klamma, R.; Harrer, A. (Ed.). Proceedings of the 8th European Conference on Technology-enhanced Learning (484−489). Heidelberg: Springer. (Lecture Notes in Computer Science). Tammets, K; Laanpere, M; Ley, T; Pata, K. (2013). Identifying problem-based scaffolding patterns in an online forum for construction professionals. In: Proceedings of the 8th European Conference on Technology-enhanced Learning, 8095: European Conference on Technology-Enhanced Learning. Ed. Hernández-Leo, D.; Ley, T.; Klamma, R.; Harrer, A. Heidelberg: Springer, 526−531. (Lecture Notes in Computer Science). Pata, K., Tammets, K., Laanpere, M., Tomberg, V. (2013). Design principles for competence management in curriculum development. In: Hernández-Leo, D.; Ley, T.; Klamma, R.; Harrer, A. (Ed.). Proceedings of the 8th European Conference on Technology-enhanced Learning (260−273). Heidelberg: Springer. (Lecture Notes in Computer Science). Pata, K. (2013). Le narrazioni come storie geolocalizzate negli ecosistemi ibridi. Claudio Bisoni e Veronica Innocenti. MEDIA MUTATIONS GLI ECOSISTEMI NARRATIVI NELLO SCENARIO MEDIALE CONTEMPORANEO. SPAZI, MODELLI, USI SOCIALI (91−108). Modena: Mucchi Editore. Siadaty, M. ,Gašević, D., Jovanović, J., Pata, K. Milikić, N., Holocher-Ertl, T., et al. (2012). 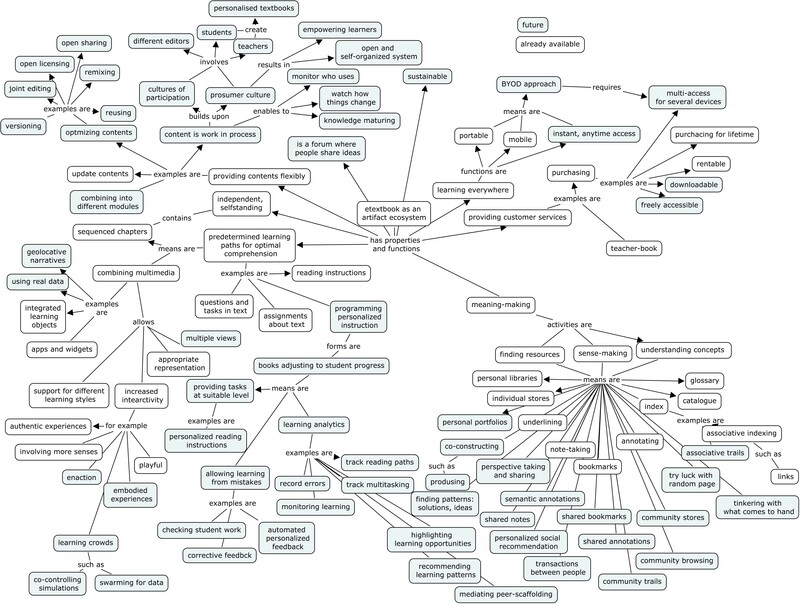 Self-regulated Workplace Learning: A pedagogical framework and Semantic Web-based environment. Journal of Educational Technology and Society, 4, 15, 75−88. Normak, Peeter; Pata, Kai; Kaipainen, Mauri (2012). An Ecological Approach to Learning Dynamics. Journal of Educational Technology & Society, 15 (3), 262−274. Tammets, Kairit; Pata, Kai; Laanpere, Mart (2012). Implementing a Technology-Supported Model for Cross-Organisational Learning and Knowledge Building for Teachers. European Journal of Teacher Education, 35 (1), 57−75, 02619768.2011.633997. Pata, K. (2012). Mental Models of Environmental Problems. In: Norbert M. Seel (Ed.). Encyclopedia of the Sciences of Learning (754−757). Springer. Pata, K. (2012). Role-Play and the Development of Mental Models. In: Norbert Seel (Ed.). Encyclopedia of the Sciences of Learning (978−1002). Springer. Laanpere, Mart; Pata, Kai; Põldoja, Hans; Normak, Peeter (2012). Pedagogy-Driven Design of Digital Learning Ecosystems – the Case Study of Dippler. Klamma, R., Specht, M., Leung, H.. Advances in Web-Based Learning – ICWL 2012 (307−317). Berlin: Springer. (LNCS; 02-04). Tomberg, V. Laanpere, M. Lamas,D. Pata, K. &amp; Gašević, D. (2012). Enhancing Learning Analytics in Distributed Personal Learning Environments. In: Growing by Architecting on top of our Memories: IEEE 12th International Conference on Advanced Learning Technologies, Rome.Ed. C. Giovannella, D. G. Sampson, & I. Aedo. Rome: IEEE Computer Society Publications, 286−287. Holocher-Ertl, T., Fabian, C.M., Siadaty, M., Jovanovic, J., Pata, K., Gasevic, D. (2011). Self-regulated Learners and Collaboration: How Innovative Tools Can Address the Motivation to Learn at the Workplace? In: Carlos Delgado Kloos, Denis Gillet, Raquel M. Crespo García, Fridolin Wild and Martin Wolpers (Ed.). TOWARDS UBIQUITOUS LEARNING (506−511). Springer Verlag. (Lecture Notes in Computer Science; Volume 6964/2011). Tammets, K., Pata, K., Laanpere, M., Tomberg V., Gaševic, D., Siadaty, M. (2011). Designing the Competence-driven Teacher Accreditation. In: H. Leung, E. Popescu, Y. Cao, R.W.H. Lau & W. Nejdl (Ed.). Advances in Web-based Learning (132−141). Springer Verlag. (LNCS). Tammets, K., Pata, K. Laanpere, M. (2011). A scenario for portfolio-based accreditation of teachers’ competences in Estonian context. In: Proceedings of the 3rd international Conference on Computer Supported Education (CSEDU). (280−289). SciTePress. Siadaty, M., Gasevic, D., Pata, K., Milikic, N., Holocher-Ertl, T. (2011). A Sematic Web-enabled Tool for Self-Regulared Learning in the Workplace. In: In Proceedings of the 11th IEEE International Conference on Advanced Learning Technologies (66−70). Athens, Athens, GA , USA: IEEE Computer Society Press. Pata, K. (2011). Participatory design experiment: Storytelling Swarm in hybrid narrative ecosystem. In: B. K. Daniel (Ed.). 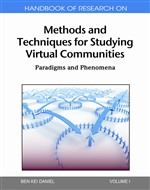 A Handbook of Research on Methods and Techniques for Studying Virtual Communities: Paradigms and Phenomena (482−508). Hershey. New York: Information Science Reference. Väljataga, Terje; Pata, Kai; Tammets, Kairit (2011). Considering learners’ perspectives to personal learning environments in course design. In: Mark J. W. Lee; Catherine McLoughlin (Ed.). 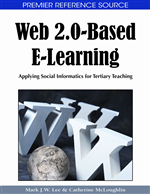 Web 2.0-Based E-Learning: Applying Social Informatics for Tertiary Teaching (85−108). IGI Global http://www.igi-global.com/. Pata, K. (2010). An ontospatial representation of writing narratives in hybrid ecosystem. In: Proceedings: Workshop on Database and Expert Systems Applications: 21st International Workshop of DEXA, 3rd International Workshop on Social and Personal Computing for Web-Supported Learning Communities. August, 30th – September, 3rd 2010, Bilbao, Spain.. Ed. A.M.Tjoa and R.R.Wagner. Los Alamitos, California: IEEE Computer Society Press, 87−91. Pata, K.; Merisalo, S. (2010). SELF-DIRECTION INDICATORS FOR EVALUATING THE DESIGN-BASED ELEARNING COURSE WITH SOCIAL SOFTWARE. In: Dirk Ifenthaler, Dr. Kinshuk, Pedro Isaias, Demetrios G. Sampson, J. Michael Spector (Ed.). 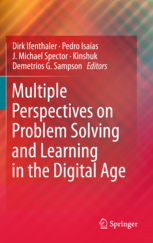 Multiple Perspectives on Problem Solving and Learning in the Digital Age (343−358). Springer. Pata, K. (2010). Tehnoloogia. Kikas, Eve (Toim.). Õppimine ja õpetamine esimeses ja teises kooliastmes (417−436). Tartu: Ecoprint. Väljataga, Terje; Pata, Kai; Tammets, K. (2010). Considering learners’ perspectives to personal learning environments in course design. In: J.W. Lee; C. McLoughlin (Ed.). Web 2.0 Based E-Learning: Applying Social Informatics for Tertiary Teaching (85−108). IGI Global. Clément, P.; Castéra, J.; Laurent, C.; Caravita, S.; Rauma-Kosonen, A-L.; Varga, A.; Turcinaviciene, J.; Samonek-Miciuk, E.; Kozan-Naumescu, A.; Pace, P.; Pata, K.; Valanides, N.; Bogner, F.; Carvalho, G. (2010). Teachers’conceptions on environment and GMO in twelve European countries. Ed. IOSTE conference (International Organization for Science and Technology Education). 1418−1421. Pata, K. (2009). Modeling spaces for self-directed learning at university courses. Journal of Educational Technology & Society, 12, 3, 23−43. Kislinger, B.; Pata, K; Fabian, C.M. (2009). A Participatory Design Approach for the Support of Collaborative Learning and Knowledge Building in Networked Organizations. International Journal of Advanced Corporate Learning, 2, 3, 34−38. Pata, K.; Fuksas, A.P. (2009). Ecology of Embodied Narratives in the Age of Locative Media and Social Networks: a Design Experiment. Cognitive Philology, 2, 1−21. Laanpere, M.; Pata, K.; Tomberg, V. (2009). Evaluating pedagogy-driven design of IVA LMS with activity pattern analysis. In: M.Spaniol, Q. Li, R.Klamma, R.Lau (Ed.). Advances in Web-based Learning – ICWL 2009 (210−214). Berlin : Springer. (Springer Lecture Notes in Computer Science (LNCS)). Pata, K. (2009). Revising the framework of knowledge ecologies: how activity patterns define learning spaces? In: Niki Lambropoulos & Margarida Romero (Ed.). Educational Social Software for Context-Aware Learning: Collaborative Methods & Human Interaction. (241−266). Idea Group Reference. Fiedler, Sebastian; Pata, Kai (2009). Distributed learning environments and social software: in search for a framework of design. In: Stylianos Hatzipanagos and Steven Warburton (Ed.). Handbook of Research on Social Software and Developing Community Ontologies. (145−158). Idea Group Reference. Kieslinger, B.; Pata, K.; Fabian, C.M. (2009). Participatory design methods for learning and knowledge sharing activities in networked organizations. In: Proceedings of ICELW 2009: The International Conference on e-Learning in the Workplace, New York, USA, June 10th-12th, 2009..CD, 1−5. Pata, K.; Merisalo, S. (2009). Self-direction indicators for evaluating the design-based eLearning course with social software. In: Kinshuk; D.G. ; Sampson; J.M. Specor; P.Isaias; D.Ifenthaller (Ed.). IADIS International Conference on Cognition and Exploratory Learning in Digital Age CELDA 2009 (196−203). Rome: IADIS Press. Väljataga, Terje; Pata, Kai, Priidik, Ele (2009). Õpikeskkonna kujundamine haridustehnoloogiliste vahenditega. Kai Pata, Mart Laanpere (Toim.). Tiigrihüpe: haridustehnoloogia käsiraamat (11−28). TLÜ Informaatika Instituut: Iloprint. Pata, K., Laanpere, M. (2009). Tiigriõpe: Haridustehnoloogia käsiraamat. TLÜ Informaatika Instituut. : Iloprint. Pata, Kai; Metsalu, Eneken (2008). Conceptualizing Awareness in Environmental Education: An Example of Knowing about Air-related Problems. Science Education International, 19 (1), 41−65. Pata, Kai; Laanpere, Mart (2008). Supporting cross-institutional knowledge-building with Web 2.0 enhanced digital portfolios. In: Paloma Diaz; Kinshuk; Ignacio Aedo; Eduardo Mora (Ed.). The 8th IEEE International Conference on Advanced Learning Technologies (ICALT 2008), July 1st- July 5th, 2008, Santander, Cantabria, Spain. (798−800). Washington: IEEE Computer Society Press. Kieslinger, Barbara, Pata, Kai (2008). Am I Alone? The Competitive Nature of Self-reflective Activities in Groups and Individually. In: ED-MEDIA 2008 – World Conference on Educational Multimedia, Hypermedia & Telecommunications. Vienna, Austria, June 30-July 4, 2008. (6337−6342). AACE. Tammets, Kairit; Väljataga, Terje; Pata, Kai (2008). Self-directing at social spaces: conceptual framework for course design. Ed-Media, Viin, 30. juuni-4. juuli, 2008. AACE, 2030−2038. Pata, K., Zimdin, L. (2008). Teaching for environmental awareness and conceptual coherence of air related problems. In: Thinking and acting outside the box. A European contribution to the UN Decade of Education for Sustainable Development : CEEE 10th conference (Conference on Environmental Education in Europe). Ed. Paul Pace . Malta, Valletta: Malta University, 8−15. Stokic, D.; Pata, K.; Devedzic, V.; Jovanovic, J.; Urosevic, L.; Gasevic, D.; Kieslinger, B.; Wild, J. (2008). Intelligent Learning Extended Organizations. In: Proceedings of Technology Enhanced Learning Conference 2008 (TELearn2008): Technology Enhanced Learning Conference 2008 (TELearn2008), Hanoi, Vietnam, (2008). Hanoi, Vietnam, 1−8. Pata, K., Väljataga, T. (2008). iCamp: Assumptions and requirements. In: Karolina Grodecka, Fridolin Wild, Barbara Kieslinger (Ed.). How to Use Social Software in Higher Education (104−113). Kraków, Poland. : Wydawnictwo Naukowe Akapit. Grodecka, K. Pata, K., Väljataga, T. (2008). Web 2.0 and Education. In: Grodecka, K., Wild, F., Kieslinger, B. (Ed.). How to Use Social Software in Higher Education (10−13). Poland, Krakow: Wydawnictwo Naukowe Akapit. Pata, K.; Pedaste, M.; Sarapuu, T. (2007). The formation of the learners’ semiosphere by authentic inquiry with an integrated learning object “Young Scientist”. Computers and Education, 49 (4), 1357−1377. Pata, K.; Väljataga, T. (2007). Collaborating across national and institutional boundaries in higher education – the decentralized iCamp approach. In: Proceedings of Ed-Media 2007, World Conference on Educational Multimedia, Hypermedia & Telecommunications: Ed-Media 2007, World Conference on Educational Multimedia, Hypermedia & Telecommunications; Vancouver, Canada; 24-29 June, 2007. Ed. Montgomerie, C.; Seale, J. Chesapeake, VA: Association for the Advancement of Computing in Education (AACE), 353−362. Väljataga, T.; Pata, K.; Laanpere, M.; Kaipainen, M. (2007). Theoretical Framework of the iCampFolio – New Approach to Evaluation and Comparison of Systems and Tools for Learning Purposes. In: Duval, E.; Klamma, R.; Wolpers, M. (Ed.). Creating New Learning Experiences on a Global Scale (349−363). Berlin/Heidelberg: Springer. (Lecture Notes in Compueter Science; 4753). Kaipainen, M.; Pata, K. (2007). Enabling Meaning-Building Communities around Locative Content Contribution. A Living Lab Framework. In: Proceedings of the 1st International Conference on Weblogs and Social Media: 1st International Conference on Weblogs and Social Media; Boulder, CO, U.S.A.; March 26-28th, 2007. Ed. N. Nicolov; N. Glance; E. Adar; M. Hurst; M. Liberman; J. H. Martin; F. Salvetti. Boulder, CO, 277−278. Pata, K.; Pedaste, M.; Sepp, E. (2007). Semiotic Perspectives to the Students’ Conceptual Development with the Virtual Inquiry in Young Scientist Environment. In: Proceedings of ED-MEDIA 2007, Ed-Media 2007, World Conference on Educational Multimedia, Hypermedia & Telecommunications: Vancouver, Canada; 24-29 June, 2007. Ed. Montgomerie, C.; Seale, J. Chesapeake, VA: Association for the Advancement of Computing in Education (AACE), 3723−3732. Sepp, E.; Pata, K.; Pedaste, M. (2007). Sidususe arendamine õpisimulatsiooniga: kontseptuaalse sidususe kujunemine veebipõhise uurimisõpikeskkonna “Noor loodusuurija” abil. Haridus, 11/12, 25−32. Pata, K.; Sarapuu, T. (2006). A Comparison of Reasoning Processes in a Collaborative Modelling Environment: Learning About Genetics Problems Using Virtual Chat. International Journal of Science Education, 28 (11), 1347−1368, 09500690500438670 . Pata, K.; Lehtinen, E.; Sarapuu, T. (2006). Inter-relations of tutor’s and peers’ scaffolding and decision-making discourse acts. Instructional Science, 34 (4), 313−341. Pata, K.; Metsalu, E. (2006). Does teaching for “ecological sustainability” influence basic school students’ environmental value systems. In: Promoting Education for Sustainable Development in Europe: 2nd European Fair on Education for Sustainable Development. 2. Messe zum Thema Bildung für nachhaltige Entwicklung in Europa; 13.-15.september, 2006; Hamburg, Germany. Hamburg, 23. Sepp, E.; Pata, K. (2006). The Role of Virtual Inquiry Simulation “Young Scientist” in Developing Students’ Conceptual Coherence. In: Models and Learning: Theory, Design and Application: 9th Conference of EARLI’s JURE; 30th June – 4th July 2006; Tartu, Estonia. Tartu: Tartu University Press, 90. Pata, K. (2006). The Influence of Virtual Inquiry with “Young Scientist” on Primary Students’ Conceptual Development About Seasonal Changes. In: Models and Learning: Theory, Design and Application: 9th Conference of EARLI’s JURE; 30th June-4th July, 2006; Tartu, Estonia. Tartu: University of Tartu, 76. Pata, K. (2006). Situatiivne e-õpe loodusteadustes. A & A, 22−25. Pata, K.; Väljataga, T.; Laanpere, M. (2006). Pedagoogiline mustrikeel ja järgmise põlvkonna e-õppe lahendused. A & A: Arvutid ja Andmetöötlus, 6, 24. Pata, K.; Sarapuu, T.; Lehtinen, E. (2005). Tutor scaffolding styles of dilemma solving in network-based role-play. Learning and Instruction, 15 (6), 571−587. Pata, K. (2005). Scaffolding of collaborative decision-making on environmental dilemmas. (Doktoritöö, Turu Ülikool). Turun yliopisto. Pata, K.; Sarapuu, T; Archee, R. (2005). Collaborative scaffolding in synchronous environment: congruity and antagonism of tutor/student facilitation acts. In: Koschman T.; Suthers D.; Chan T.-W. (Ed.). Computer supported collaborative learning 2005 : the next 10 years! (484−493). Mahwah, NJ: Lawrence Erlbaum Assoc Inc.
Pata, K.; Sarapuu, T. (2005). The influence of different reasoning processes in expressive and exploratory synchronous environment on the development of students’ problem representations in genetics. In: Trends in Biology Education Research in the New Biology Era: 5th Conference of European Researchers in Didactic of Biology (ERIDOB), 21.09.-25.09.2005, Patras, Greece. Ed. Ergazaki, M.; Lewis, J.; Zogza, V. Patras, Greece: Patras University Press, 217−232. Pata, K. (2005). Keskkonnaalase otsustamisoskuse kujundamise metoodikaid. Artiklite kogumik. Henno, I.. Loodusainete õpetamisest koolis (133−140). Tallinn: Riiklik Eksami ja Kvalifikatsioonikeskus. Pata, K.; Sarapuu, T. (2004). Information-processing and conceptual change in network-based synchronous modeling environments. 1-7: World Conference on Educational Multimedia, Hypermedia and Telecommunications (ED-MEDIA), 21.06.-26.06.2004, Lugano, Switzerland. Ed. Cantoni, L.; McLoughlin, C. Norfolk, VA, USA: Association for the Advancement of Computing in Education (AACE), 3993−4000. Pata, K. (2004). Collaborative decision-making in synchronous environment from science teachers’ and students’ viewpoints. In: Pandis, Meelis (Ed.). Kasvatusteadused muutuste ajateljel (247−260). Tallinn: TPU Publishers. Pata, K.; Puusepp, A.; Sarapuu, T. (2004). Scientific representation and design in collaborative learning about buoyancy. In: Current research on mathematics and science education: XXI annual symposium of The Finnish Association of Mathematics and Science Education Research. Ed. Laine, A.; Lavonen, J.; Meisalo, V. Helsinki, Suome: Helsinki University Press, 550−569. (Research Report; 253). Pata, K.; Sarapuu, T. (2004). The development of students’ mental models by learning with expressive and exploratory tools in synchronous environment. In: Current research on mathematics and science education: XXI annual symposium of The Finnish Association of Mathematics and Science Education Research. Ed. Laine, A.; Lavonen, J.; Meisalo, V. Helsinki, Suome: Helsinki University Press, 570−590. (Research Report; 253). Pedaste, M.; Sarapuu, T.; Pata, K. (2004). Noor loodusuurija. . Tartu: Tartu University. Pata, K.; Sarapuu, T. (2003). Framework for scaffolding the development of problem representations by collaborative design. In: Wasson B.; Ludvigsen, S.; Hoppe, U. (Ed.). Designing for Change in Networked Learning Environments (189−198). Berlin: Springer. (Computer-Supported Collaborative Learning Series; 2). Pata, K.; Sarapuu, T. (2003). Meta-communicative regulation patterns of expressive modeling on whiteboard tool. World Conference on E-Learning in Corporate, Government, Healthcare, & Higher Education (E-Learn), 07.11.-11.11.2003, Phoenix, Arizona. Ed. Rossett, A. Norfolk, VA, USA: Association for the Advancement of Computing in Education (AACE), 1126−1129. Pata, K.; Sarapuu, T. (2003). The development of shared mental models in solving environmental problems during the collaborative role-play in synchronous CSCL environment. 4th Conference of European Researchers in Didactic of Biology (ERIDOB); Toulouse, France; 22.-26.10.2002.Toulouse, France, 267−275. Pata, K.; Sarapuu, T. (2003). Developing students’ mental models of environmental problems by decision-making role-play in synchronous network-based environment. In: Biology Education for the Real World. Student – Teacher – Citizen: 4th Conference of European Researchers in Didactic of Biology (ERIDOB), 22.10.-26.10.2002, Toulouse, France. Ed. Lewis, J.; Magro, A.; Simonneaux, L. Toulouse, France: Paragraphic – Groupe Lienhart, 335−348. Pata, K.; Sarapuu, T. (2003). Development of mental models by environmental role-play in synchronous Collaborative Virtual Workplace. International conference on e-Learning in Science and Environmental Education (e-LSEE), 01.10.-04.10.2003, Tartu. Ed. Kikas, Ü.; Linnas, A. Tartu: Tartu University Press, 37−40. Puusepp, A.; Pata, K.; Sarapuu, T. (2003). Scientific representation and design in collaborative learning. International conference on e-Learning in Science and Environmental Education (e-LSEE), 01.10.-04.10.2003, Tartu. Ed. Kikas, Ü.; Linnas, A. Tartu: Tartu University Press, 45−48. Pata, K. (2002). Ühisõpet mõjutavad faktorid sünkroonses õpikeskkonnas: Artiklite kogumik. Sotsiaal- ja kasvatusteaduste ühishuvid ja dialoog: Sotsiaal- ja kasvatusteaduste doktorantide I teaduskonverents 18.-19. aprillil 2002 TPÜ-s.. Toim. Lepik, Aira; Poom-Valickis, Katrin. Tallinn: TPÜ Kirjastus, 319−337. Pata, K.; Sarapuu, T. (2002). Keskkonnaotsused rollimänguna. Haridus : Eesti pedagoogilise üldsuse ajakiri , 2, 53−55. Pata, K.; Sarapuu, T. (2001). Application of cooperative learning environment in developing students’ environmental decision-making skills. World Conference on Educational Multimedia, Hypermedia and Telecommunications (ED-MEDIA), 25.06.-30.06.2001, Tampere, Finland. Norfolk, VA, USA: Association for the Advancement of Computing in Education (AACE), 1456−1458. Pata, K.; Sarapuu, T. (2001). The role of scaffolding in environmental decision-making in synchronous learning environments. In: Science and Technology Education: Preparing Future Citizens, 1: 1st IOSTE Symposium in Southern Europe, 29.04.-02.05.2001, Paralimni, Cyprus. Ed. Valamides, N. Nicosia, Cypros: IOSTE, 439−447. Pata, K.; Sarapuu, T. (2001). Virtuaalsete õpikeskkondade mudelitest. Kool keset kaost ja korda: Telemaatika 2000, 17.11.-19.11.2000, Tartu. Toim. Tuisk, T.; Märdimäe, A.; Laane, R. Tartu: Sihtasutus Archimedes, 46−52. “Kiili, Jaanus;Leuhin, Illar;Pata, Kai” (2001). Praktilisi töid loodusõpetuses : abiraamat põhikooli õpetajale. Tartu: Eesti Loodusfoto. Pata, K. (2001). The Application of the Collaborative Virtual Workplace (CVW) in Developing Students’ Environmental Decision Making Skills. In: . Tartu: University of Tartu. Nöps, Jю; Pata, Kю; Kivi, Lю; Roosleht, Mю; Vares, Mю; Voolaid, Hю; Tuuling, Lю (1998). Vaatame kööki! : [MIKSIKEse õppekava järele kirjutatud loodusõpetuse, emakeele ja matemaatika töölehed 2. klassile]. Tartu: Miks ja millepärast. Nöps, J.; Pata, K.; Kivi, L.; Roosleht, M.; Vares, M.; Voolaid, H.; Tuuling, L. (1998). Meie meeled – uks maailma : [MIKSIKEse õppekava järele kirjutatud loodusõpetuse, emakeele ja matemaatika töölehed 2. klassile]. Tartu: Miks ja millepärast. Pata, K.; Kivi, L.; Roosleht, M.; Vares, M.; Voolaid, H.; Tuuling, L. (1998). Jõud ja liikumine : [MIKSIKEse õppekava järele kirjutatud loodusõpetuse, emakeele ja matemaatika töölehed 3. klassile]. Tartu: MIKSIKE. Sokk, S.; Pata, K.; Kivi, L.; Roosleht, M.; Vares, M.; Pedastsaar, T.; Tuuling, Liina (1998). Elutu maailm : [MIKSIKEse õppekava järele kirjutatud loodusõpetuse, emakeele ja matemaatika töölehed 1. klassile]. Tartu: MIKSIKE. Pata, K.; Nöps, J.; Kivi, L.; Roosleht, M.; Vares, M.; Tuuling, L.; Pedastsaar, T. (1998). Linnulennul üle Eestimaa : [MIKSIKEse õppekava järele kirjutatud loodusõpetuse, emakeele ja matemaatika töölehed 2. klassile]. Tartu: MIKSIKE. Laius, M.; Pata, K.; Kivi, L.; Roosleht, M.; Vares, M.; Pedastsaar, T.; Tuuling, L. (1998). Sihid silmapiiril : [MIKSIKEse õppekava järele kirjutatud emakeele ja matemaatika töölehed 3. klassile]. Tartu: MIKSIKE.